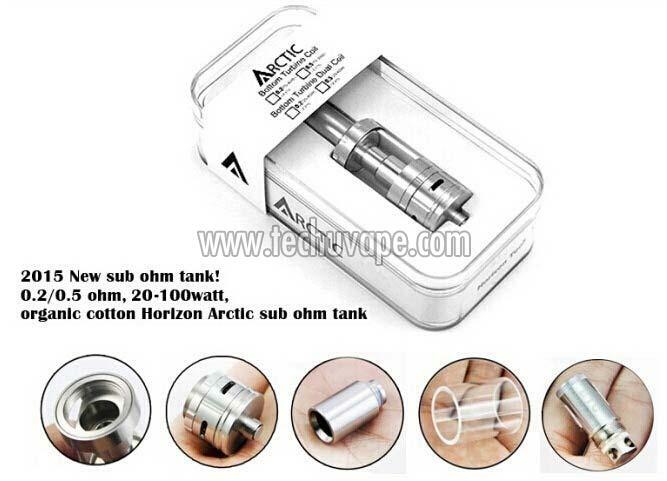 ntroducing the Arctic Sub-Ohm BTDC Tank , the next evolutionary step of the Sub-Ohm Tank Era! Horizon has developed their Bottom Turbine Dual Coil (BTDC), a 0.2 ohm coil that can be driven up to 100 watts! Also included is Horizon's 0.5 ohm BTDC coil, which is optimally driven from 30 to 80 watts. In order to supplement this capability, the Arctic has quadruple adjustable airflow slots, each measuring at a tremendous 3mm by 1mm! Each BTDC coil is specifically designed to maximize wicking rate in order to keep up with the incredible output, integrating USA Made Kanthal and Organic Cotton for top notch flavor and quality. An included wide bore stainless steel drip tip synergizes with the airflow and coil systems, enabling the max potential right out of the box. Manufactured out of 304 Stainless Steel and Pyrex Glass, and with a tank capacity of approximately 2.5 milliliters, the Arctic combines performance, quality, affordability, and ease of use in an all inclusive package. The industry has a new heavyweight champion.